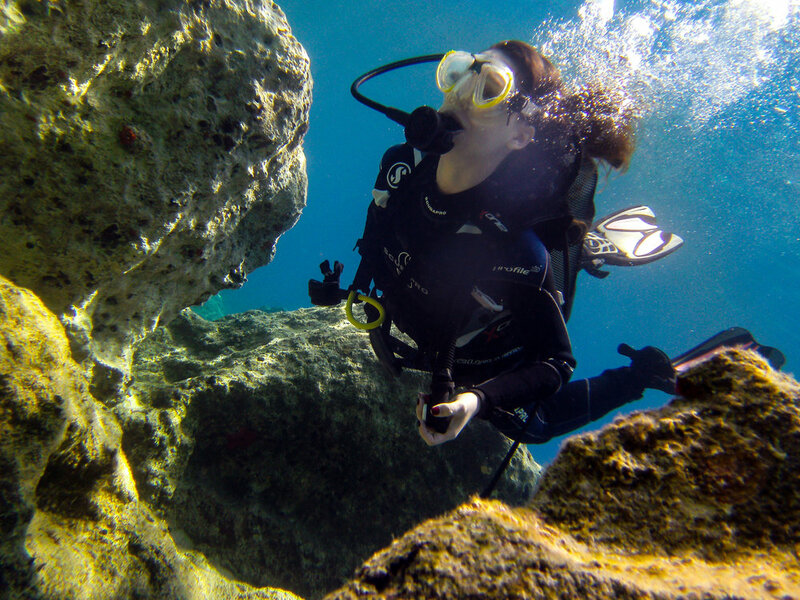 Learn to dive and be certified in the crystal clear waters of this beautiful Ionian island. Our team of PADI qualified diving instructors works with a ration of 1:4 giving you all the support and attention you require. We have been working with beginner divers for many years and can gently guide you whilst you develop new skills and discover a new underwater world. The PADI Open Water Course is the first scuba diving certificate. Before the course starts, we will give you guidance while you prepare your diving theory and do your exams online. During the course, you will complete five sessions at shallow water in areas where there are no currents and no waves so you can fully focus on developing your new skills. Then we will do four open water dives at a maximum depth of 18 metres which are carried out in areas more exposed to the open sea. These dives will increase your confidence and your skill level as well as show you the thrill of progressing your skills at greater depth. The PADI Scuba Diver course is a short introduction to diving which prepares you towards the Open Water certification at any PADI dive centre. Before the course starts, we will give you guidance while you work on your diving theory and do your exams online. During the course, you will complete three sessions at shallow water in areas where there are no currents and no waves so you can fully focus on developing your new skills. Then we will do two open water dives at a maximum depth of 12 metres which are carried out in areas more exposed to the open sea. These dives will increase your confidence and your skill level as well as show you the thrill of progressing your development at greater depth. Once you finish the course, you will be certified as Scuba Diver and it will count towards your Open Water certification. This courses are child friendly and children can participate from age 10. We meet every morning at our base camp and do pre-dive preparation and equipment. When we are ready, we pack our equipment either on our truck or the rib and go to the appropriate location for the skills you will be learning on that day. Ithaca has beautiful remote coves that we use during the courses. The water is crystal clear and you can expect to see sea grass, octopus, lobsters, sponges, anemones, moray eels, giant clams and different varieties of fish. The island is steeped in history so underwater artifacts can be seen everywhere such as small wrecks, pieces of ancient amphorae and world war II objects. Vathi has a choice of restaurants and bars to socialise in the evenings. In summer, we normally have groups of divers and kayakers so the evenings are a great opportunity to make new friends. The food in the island is fresh, and of good quality. Ithaca produces olive oil, goat and sheep's cheeses, tomatoes, onions, peppers and many other vegetables. For your accommodation, we will pick one of the family hotels we use. They are all located close to the centre of Vathi, are comfortable and have views. **We also offer dives outside the courses if you fancy booking more dives to tag onto your course or you are already qualified and would like to dive in the island. Transfers to and from dive sites, equipment, PADI instructor.